Amco Metal, one of the leading manufacturers and exporters of this impeccable range of Industrial Pipes, Fittings and Sheets, established its operations in the year 1981. This range is inclusive of products like Industrial Pipes, Screwed Pipe Fittings and Industrial Pipe Fittings, which are widely acclaimed and asked for in the market. Manufacturing of this range is done in compliance with the set industry norms and guidelines, utilizing the finest raw materials and modern machinery. Because of this, the offered range has a superior sturdiness, durability and dimensional accuracy. In addition, the range is marked at the most reasonable rate possible. 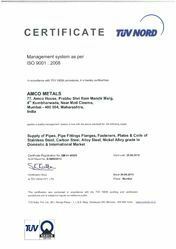 For reasons of attaining several of the firm’s goals and objectives, the state-of-the-art infrastructure at Amco Metal has been equipped with all the required tools and equipment. For the purpose of better management of our operations, we have parted the facility into several highly operational units. Our units with utmost precision and dedication, maximizes the productivity of the firm. To boost our presence in the market, we keep upgrading the facility on a highly regular basis. We are exporting our products to Saudi Arabia, Dubai, Brazil, Canada and Australia. Along with these our abidance of the industry ethics, has helped us in generating a huge client base.Under the guidance of our highly experienced manager Mr. Kalpesh Sheth / Mr. Hardik Sheth, attainment of the firm’s goals is efficient and effective. Their ability to manage, foresee market changes and make commendable decisions, have been a boon to us, since day one. In addition, he provides regular increments and rewards to the deserving candidates, for maximum employee satisfaction. Sainless Steel : Available in grades: ANSI 202/ 304/ 304L/ 304H/ 316/ 316L/ 317/ 317L/ 312/ 310, etc. Pipe & Tube Fittings : Buttweld pipe fittings, socket-weld, threaded etc. Along with forged fittings in the form of elbow, tee, reducer, coupling, socket, return bend, stub-ends, cap, collar, cross, insert, etc. Pipes & Tubes : Stainless steel pipes, carbon steel and alloy steel pipes including seamless tubes, welded tubes, slot tubes etc. fabricated of all sizes and grades. Other Products : Rods, flats, bars, wires, hex, nut-bolts, high tensile fasteners, shims welding electrodes (SMP Korea/LAKE China), filler-wires. Optimizing our in-depth industry experience and skilled workforce, we are catering to the diversified requirements of various industries.